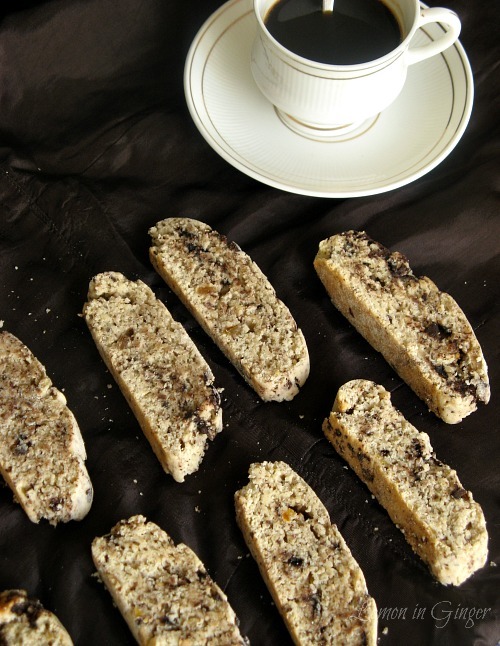 Eggless Biscotti is becoming a tradition in my family. 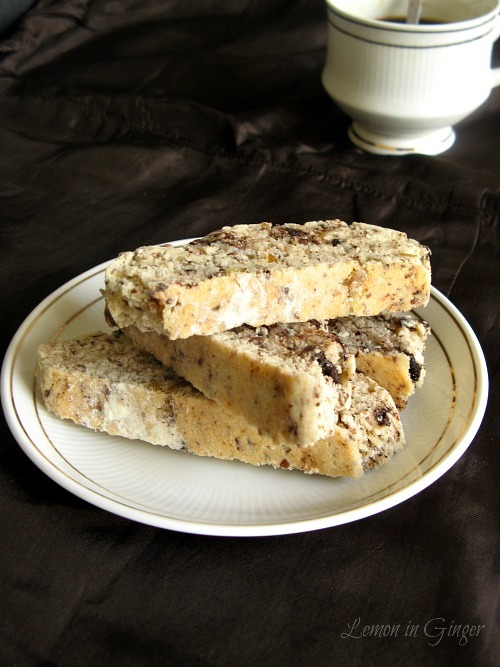 Replacing egg with flaxseed works perfect and allow me to enjoy this baking delicacy! My mom came over to help me take care of kids, while I attended 1 week module at NIFT. So I baked these crunchy and perfect dunk-in snack to send with her for my family at home. Baking these biscottis, also gave me a chance to use up whatever leftover candied ginger I had from baking Eggless Christmas Cake. I so loved the recipe and wanted to coat in melted chocolate as well, but I ran out of chocolate and just had enough to add few chopped bits in the batter. Apart from sending it to my sister & kids, I saved a few for V as well. It was a perfect hit with everybody! There is very little that can go wrong with a biscotti. 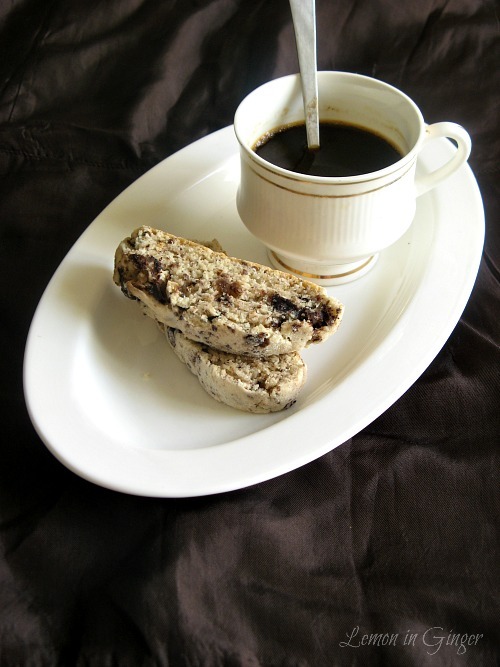 Rather biscotti is a perfect way to salvage, undercooked cakes & breads. Ideal snack with cup of coffee or tea. Crunchy & perfect for dunk-in. Mix flax seed powder & warm water. Mix well & allow to stand for 5-10 mins. In a large mixing bowl, beat together the butter and sugar until light and fluffy. Add flax seed mixture and beat well. Mix in the vanilla extract. Gradually add the flour, baking powder, and salt, mixing until uniform. Stir in the chopped chocolate and candied ginger. The dough will be sticky. On a floured surface, form dough into a log 12-inches long by 3-inches wide and transfer to a baking sheet. Bake cookies for 25-30 minutes, or until the dough cracks on top and just begins to brown. Allow to cool on the cookie sheet for ten minutes, or it is cool enough handle. Using a serrated knife, cut the log into 1/2-inch slices. Place the slices cut side down onto the baking sheet. Reduce the oven temp to 150 C.
Bake for an additional 10-12 minutes, or until the biscotti slices are lightly browned for a softer texture. 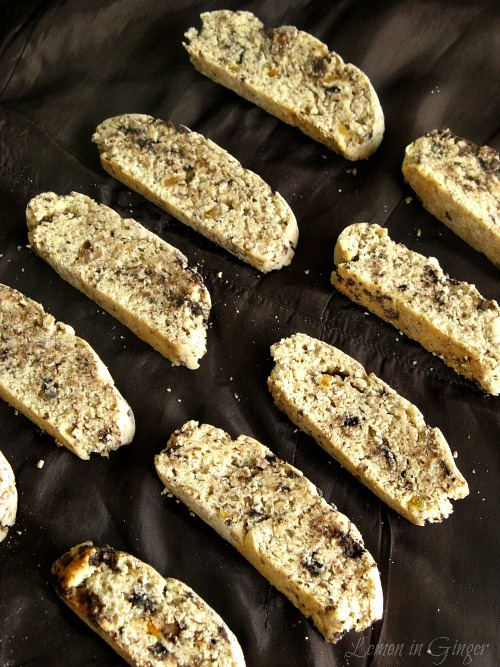 For a crunchier texture, flip the biscotti over and bake for another 10-12 minutes. 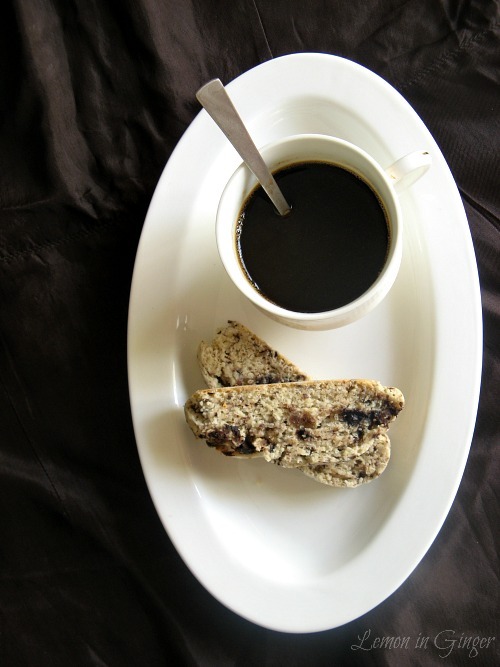 Cool biscotti to room temperature. Dunk in a hot cup of coffe & enjoy! Substitute candied ginger with any nut as per your taste. Coat in Chocolate for a yum taste!